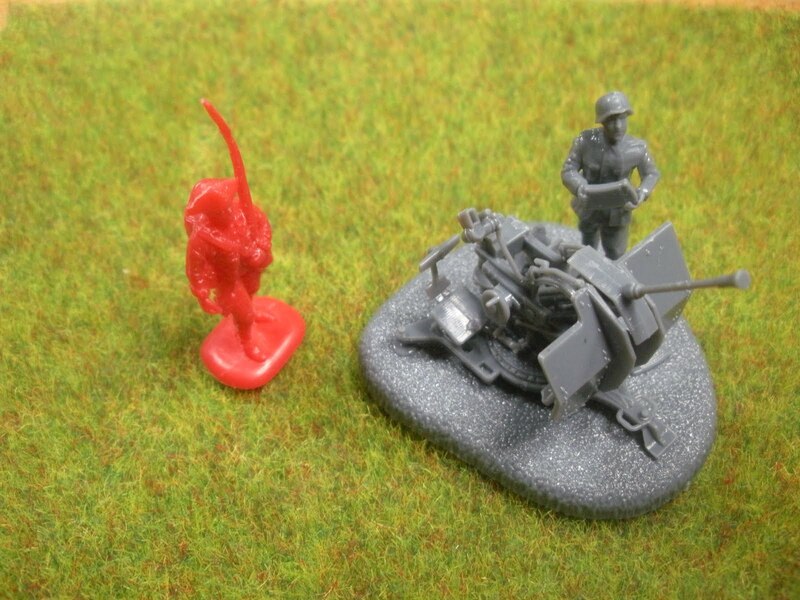 I've had the Zvezda 20mm Flak-38 kit (Zvezda 6117) sitting on my desk for a while now, and finally have gotten around to take a few minutes to put it together. It's a nice kit that is quick and simple to put together, but there are a few places where a bit of care and forethought are required. One of the nice surprises I found was that the plastic could be glued together with liquid plastic cement. I don't think the weld is as strong as for a regular styrene kit, but it seems to hold fairly well. The one big problem I found with the kit, was that the slot at the end of the arm where the sight (A6) was supposed to be attached was not there. From the box art, it looks like the model and instructions are in complete agreement. 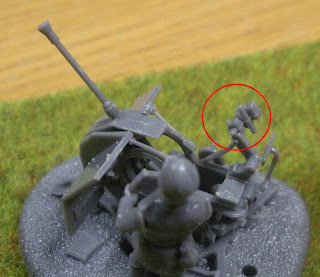 However in my kit, the arm did not look like the illustration in the instruction sheet, or the model in the box art. 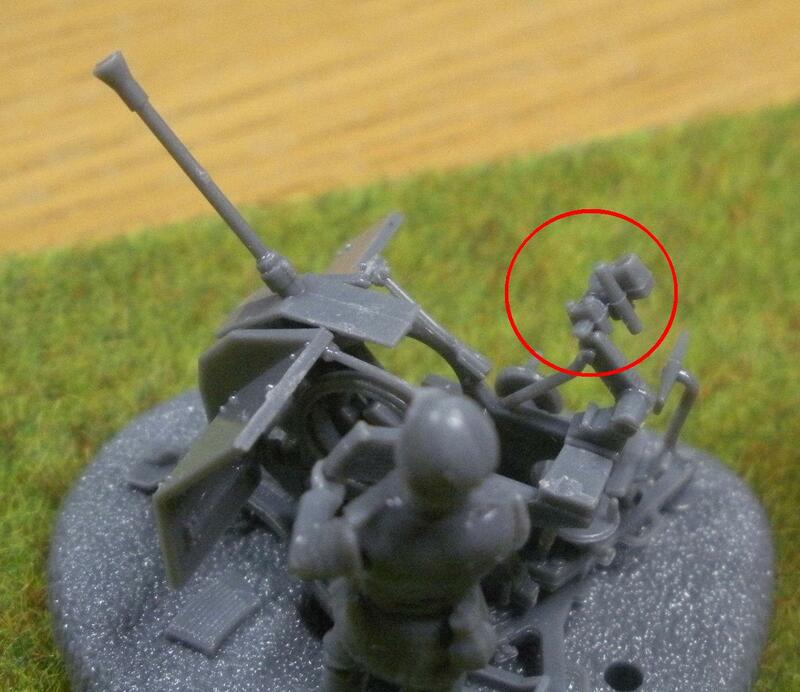 There was a small divot at the end of the arm, but no slot for the peg on the sight to fit into. I just glued the peg onto the end of the arm. I've seen a couple of other builds where people just left the sight off completely. I don't know if the part was not designed as shown on the instruction sheet, short-shot, or if I messed up the attachment point when I clipped the piece from the sprue. In any event, be careful while removing part A9. I would also recommend taking a sharp hobby knife to widen the holes for fitting the gunners seat (A8), and the hole in part A5 for fitting the brace on the main gun assembly. I ended up mangling the chair, and broke the brace because the holes were too tight. For this step, I would also suggest putting the seat in place before attaching the gun assembly. The final place to pay attention to is for the optional control wheels. I didn't really pay attention to the figure, and just attached the wheels (A3) to the gun. Afterwards, I noticed that the figure was molded with wheels in his hands. I look forward to seeing more of these Zvezda Art of Tactic kits. Nice little review....the only problems with the new tvezda sets is.. I agree that the Zvezda kits are rather expensive now. I think when they were first released, the sets were selling at around US$3.50, but they are now selling at close to US$6 a box.